About a month ago, I made this Quiche for a quick Saturday night supper when my sister and her husband were in town. It was incredible! Seriously, I took a bite and I think I complimented myself on the deliciousness. 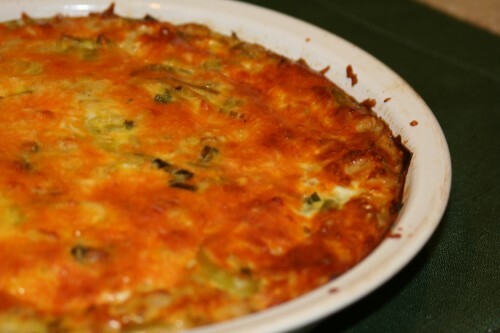 And when I went to town this weekend I brought along some leeks for the express purpose of making this recipe for my parents. And once again, everyone loved it! I found the recipe in Recipes from the Root Cellar by Andrea Chesman. The first time I made the recipe I added chopped mushrooms and put it all in a pie crust. The second time, no mushrooms, no crust. Both times, delicious. So, that's to say, the recipe is adaptable and easily made gluten-free. Melt the butter in a large skillet over medium heat. Add the leek and saute until limp, about 3 minutes. Add the apple and saute until the leeks are tender, about 3 minutes. Stir in the flour and thyme. Sprinkle 1/2 c. of the cheese into the pie shell. Layer the leek mixture on top. Cover with remaining cheese. Beat the eggs in a glass measuring cup and add enough milk to make 1 1/2 cups. Season with salt and pepper. Pour over the pie filling. Bake for 30-35 minutes, until puffed and browned. Let stand for at least 10 minutes before serving. Although the addition of apples makes me nervous, I am excited to try this. I really like quiche. Thanks for this recipe! i loved this recipe when you made it! i'm definitely going to have to make it myself sometime soon. Stephanie, I made this recipe a couple days ago and it was great! So easy and delicious. I think I didn't add enough butter in the beginning and was afraid the leeks & apples were going to burn so I added some apple cider and it worked out fine. I was also thinking of adding some bacon next time...yum! Amy I'm so glad you liked the quiche! Apple cider was a great idea. I definitely think bacon or ham would be great in this dish. Fantastic! I made it without the pie shell, and it was delicious :) Thank you for sharing this recipe!